Talent Quatro OLR - Birds delivery from Norway 2nd of April! The Norwegian birds for Talent Quatro OLR 2019 will be transported from Norway the 2nd of April. 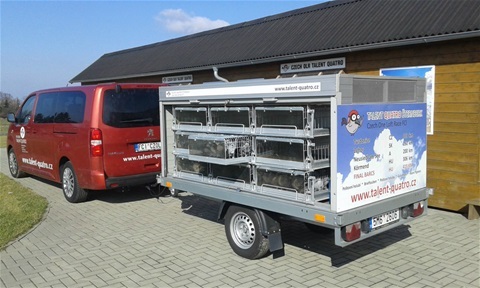 Latest delivery of birds will be at Stavanger Monday 1st of April 18:00. Alternative delivery will be at our loft Sunday 31st of March within 20:00 a´clock. Please contact us, if you like to participate and need some more info. See Talent Quatro web page for OLR details. Prize for a team of 6 birds (5 birds + 1 free) is 350 EUR + transport. Alternative, you can pay 70 EUR per bird if you like to participate with less a one team.